Are you ready to add chickens to your backyard this spring? 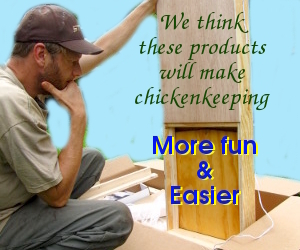 Or maybe you already have a flock and want to up your chickenkeeping game? If so, you’re in luck — my complete line of permaculture chicken ebooks is now available right here at a reduced price! Be sure to start with your free copy of The Working Chicken. Then you might want to check out my paid ebooks, which are 17% to 25% off their price on online retailers if you buy direct right here. Enjoy!